The ultra-low-cost carrier's turnaround is gaining steam, with unit revenue finally bouncing back from several years of declines. Spirit Airlines (NYSE:SAVE) has taken shareholders on a wild ride over the past few years. Increased industry competition -- partially related to lower oil prices -- caused revenue per available seat mile (RASM) to plunge beginning in late 2014. Fuel prices bottomed out in early 2016 and started rising quickly later that year, but Spirit's unit revenue continued to decline. 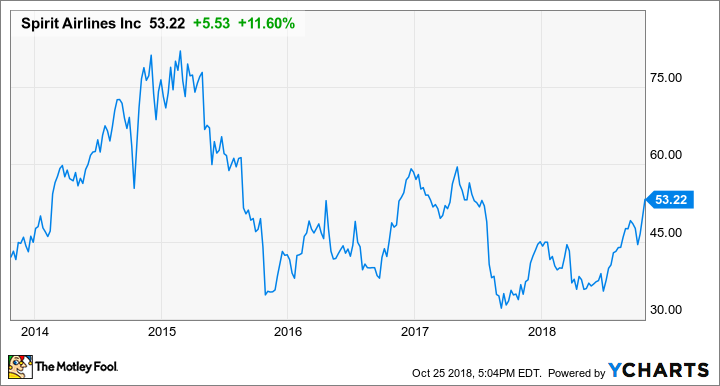 As a result, Spirit Airlines stock plunged more than 60% between late 2014 (when it reached its all-time high near $85) and late 2017 (when it bottomed out just above $30). However, Spirit Airlines shares have started to make a comeback in the past few months. The company's strong third-quarter earnings report -- released on Wednesday afternoon -- added to this momentum. In response, Spirit Airlines stock rose 11.6% on Thursday, reaching a new 52-week high. In the first half of 2018, Spirit Airlines' RASM fell 4.6%, due to the lingering effects of fare wars that broke out in several markets in mid-2017. However, as of late July, management expected RASM to increase 2% to 3% in the third quarter, with the return to unit revenue growth driven by easier year-over-year comparisons, as well as benefits from Spirit's revenue initiatives. The end result was even better. RASM surged 5.5% last quarter, in line with updated guidance the company provided earlier this month. Higher load factor (the percentage of seats filled with paying customers), higher fares, and higher non-ticket revenue per passenger all contributed to the strong unit revenue growth. Spirit Airlines also expanded its capacity by nearly 25% last quarter, so total revenue skyrocketed 31.6%, to $904.3 million. Meanwhile, adjusted non-fuel unit costs fell 3.7% year over year, and fuel efficiency improved by 2.8%. This partially offset a 35% surge in fuel prices. The net result was that Spirit Airlines' adjusted pre-tax margin slipped to 14.5% from 15% a year earlier. Nevertheless, adjusted earnings per share (EPS) surged 56%, to $1.47, due to the company's strong revenue growth and a lower federal tax rate. Spirit Airlines' cost performance was remarkable in light of substantial pilot pay increases that went into effect earlier this year. However, the carrier is benefiting enormously from a decision to buy 14 previously leased Airbus A319s this spring. Aircraft rent expense plunged 20% year over year last quarter. Spirit Airlines recently reduced its costs by buying 14 aircraft it had been leasing. Image source: Spirit Airlines. While Spirit Airlines is benefiting from easy year-over-year comparisons right now, management insists that there are more fundamental improvements driving its RASM growth. For one thing, the carrier has improved its reliability significantly and seems genuinely committed to delivering better service -- although its low fares/high fees pricing strategy isn't going to go away. Outgoing CEO Bob Fornaro noted some other key changes, saying: "[O]ver the last three years we have diversified our network, increased density in several key markets to allow for increased connectivity, and culled many of our underperforming routes. We are just beginning to reap the benefit of all these changes and are excited about the potential to leverage them further." For example, Spirit Airlines launched an ambitious international expansion in Orlando earlier this month using capacity redeployed from underperforming markets. In addition to serving the local market, management says the new routes will provide more connecting options for customers, complementing Spirit's existing international service from Fort Lauderdale. Spirit Airlines also has invested extensively in new data-analysis tools and refined its use of the data it collects in order to maximize unit revenue. Looking ahead to the fourth quarter, Spirit Airlines expects RASM to rise about 6% year over year. But unlike last quarter, non-fuel unit costs also will increase by roughly 5% to 6%, due to the timing of certain expenses and higher labor costs. Fuel costs will remain a major headwind, too, with jet-fuel prices projected to climb to $2.46 per gallon from $1.97 per gallon a year ago. Pulling together all these elements of the company's forecast, revenue is on track to comfortably surpass $800 million while adjusted pre-tax margin should decline to around 8% from 12% in the fourth quarter of 2017. Even if that happens, Spirit's adjusted EPS would be roughly flat year over year, thanks to its healthy revenue growth and the lower tax rate in effect this year. Moreover, Spirit Airlines expects modest non-fuel unit cost inflation of 0% to 1% in 2019. The year-over-year fuel cost headwind also will lessen, barring another big spike in oil prices (which is always a possibility, of course). Management sees plenty of opportunities to keep Spirit's unit revenue moving higher in 2019, including updates to its credit card and loyalty programs. Based on the relatively favorable cost environment expected for 2019, that would drive strong profit growth -- paving the way for Spirit Airlines stock to continue rallying.